WASHINGTON, D.C. — Today the Institute for Energy Research released a study that delivers a sobering economic analysis of six carbon tax scenarios, including one that mirrors the tax-and-rebate scheme proposed by the Climate Leadership Council. The analysis, commissioned by IER and conducted by Capital Alpha Partners, LLC, uses standard scoring conventions (similar to those used by JCT, CBO and Treasury) to evaluate and model the economic impacts of carbon taxes set at a variety of dollar figures, with different phase-in durations, and with an array of revenue-recycling strategies. “The release of this analysis comes at an important time as numerous carbon tax proposals arise in Washington and are being considered for introduction in Congress. 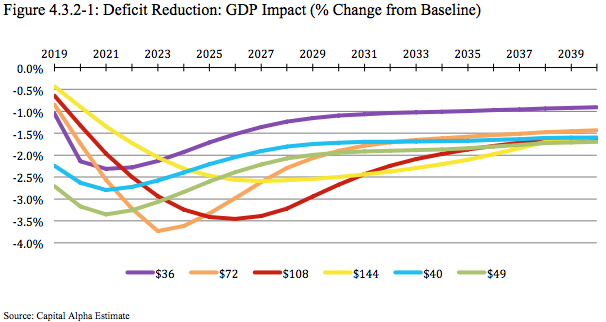 This study shows that when carbon tax scenarios are subject to the same scrutiny as an actual legislative proposal, it is all pain and no gain for the overall economy, with the states, in particular, being significantly impacted. For the key takeaways, click here.